During the winter, remember the principle that foods that take longer to grow are generally more warming than those that grow quickly. This means meats such as chicken, beef and lamb. Rich, densely textured meat, such as goose, is available fresh from the end of September. Look for a goose that is plump, with pale, unblemished skin, beneath which there is a good layer of fat. Rich and full of flavour, duck meat is extremely nutritious. Wild duck are available from October to December. Another great alternative to chicken is Guinea Fowl – it has a lovely flavour that is slightly gamey but very subtle (much less assertive than pheasant or grouse). Venison used to describe meat of any furred game, but it has since come to mean deer. Wild red and fallow deer is in season from 21 October to 15 February. The meat should have a deep colour, with a dense texture. British apples are at their best from September through to November. Look for firm fruit, with no blemishes, bruising or wrinkles. Don’t be fooled by a very shiny skin – many apples are waxed to make them look good. Try sautéeing quartered and peeled apples in butter with a handful of sultanas until golden. Add a lug of calvados, a sprinkling of sugar and a squeeze of lemon juice, and continue to cook until just tender. Delicious served with ice cream and pancakes. Like apples, to which they are related, pears come in thousands of varieties, of which only a small fraction are sold in the UK. Their fine, slightly granular flesh is much more fragile than apples and, unlike most fruit, they improve in flavour and texture after they’re picked. Pears are best enjoyed from September through to January. Quince may look knobbly and ugly, with an irregular shape and often a grey fuzz, but once it’s cooked, it’s soft and tender, creating a lovely syrup. British quinces are in season from October through to December, and you could easily grow your own tree at home. Since fresh figs are one of the most perishable fruits, they should be purchased only a day or two in advance of when you are planning on eating them; preferably from late June to early autumn. Look for figs that have a rich, deep colour and are plump and tender, but not mushy. In autumn, turn towards warming, harvest foods such as carrot, sweet potato, onions and garlic. Put extra emphasis on warming spices and seasonings such as ginger, peppercorns and mustard seeds. 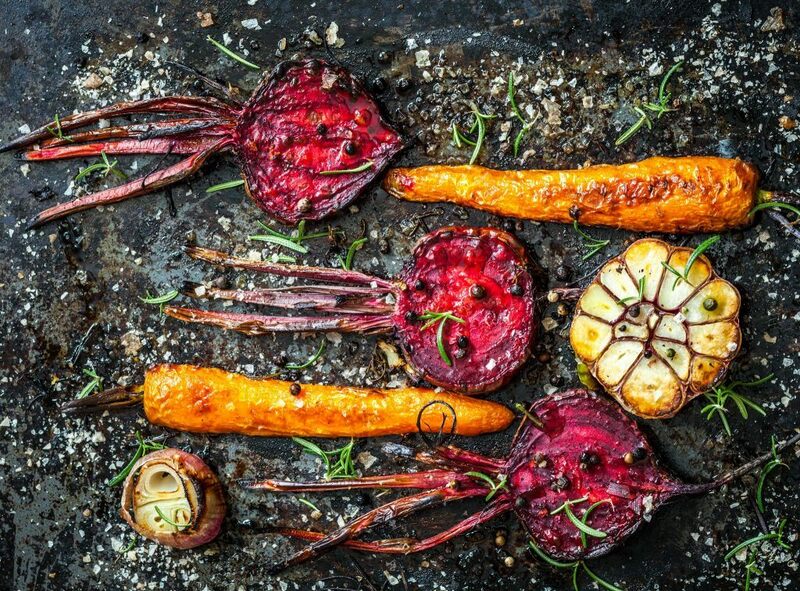 As the weather gets colder, look to root vegetables as well as corn and nuts. At their best from September to March, leeks are a member of the allium family, but have their own distinct flavour – quite harsh when raw (only very young leeks are eaten this way) but, when cooked, very delicate, like a mild onion but with a hint of sweetness. The unsung hero of the vegetable world, knobbly, odd-shaped celeriac has a subtle, celery-like flavour, with nutty overtones. Try it as mash, in big-flavoured, slow-cooked dishes, or in its classic form, and as they do in France, as a remoulade. Celeriac is at its best from September to April. Kale is king for seasonal eaters! It tastes and grows best during the coldest of months, particularly January. It’s perfect for adding extra nutrition to hearty stews and soups like Scotch broth. runs from October to December. Other good options during this season are sweet potato and wild mushrooms, which are available from September to November. Once regarded as the poor relation of the shellfish family because of their small size and relative abundance, mussels are now very popular and fairly cheap. The most common blue or European mussels have sleek, shiny shells and tender, nutritious flesh, and are available from October to March. Another winter favourite at Create is Turbot.This large flatfish is prized for its firm white flesh and subtle, refined flavour. Although it’s not the cheapest of fish when cooked perfectly (we’d recommend en papillote) it makes a stunning winter dish.